Corporal Chris Fairey MBE formed a Barracks Swimming Club with a few keen swimmers from Royal Marines Barracks Stonehouse and HQ Commando Forces at Hamoaze House Mount Wise. In January the club formed as Royal Marines Barracks Stonehouse Swimming Club using the Ballards centre pool with Plymouth Leander Swimming Association. Later this year water time was made available at both HMS Raleigh and HMS Drake. The Club consisted of 10 Royal Marines and 10 WRNS, with Chris as the Coach. Club members attended the life saving bronze medallion course. Four members passed and one received the award of merit. One swimmer, Marine Nigel Owen entered the Western Counties Masters championships gaining 12th place overall. First RMB Stonehouse Swimming Club Championships were held at HMS Drake. The Club entered Plymouth Leanders Masters Open Meet, gaining three 1st, one 2nd and two 3rd places. Teams competed against Plymouth Leander, Port of Plymouth, Exeter City, Newton Abbot, Tavistock, Brixham and St Austell. First RMB Stonehouse Open meet held. In November the Club started training with Devonport Royal Swimming Club for additional water time. Five swimmers attended the Royal Navy proficiency course at HMS Temeraire. Again officials from Devon County ASA attended, as did a PTI Course from CTCRM for officials training. Four trophies allocated for these Championships. • A Club diver was selected to dive for the RN and Combined Services. • Five water polo players selected for RM and RN squads. • Four swimmers selected for RM and RN squads. RMB Stonehouse Swimming Club second open meet. A number of swimmers took part in the Inter Service Masters gaining 35 medals making a large contribution towards the RN gaining the Inter Service Trophy. Swimmers entered the Weyport Masters proficiency course. Several club members attended the National BT Swimathon, won individual and team prizes. • Six members selected for the US Tour 94 as part of the RM Corps squad. • RM Diving Championships, club member gained first place and won the Lyness Trophy. • One swimmer entered the Great Britain Masters at Leeds and gained three 4th places. • RM Corps Championships - RM Stonehouse won the minor units trophy. • Five club members selected for RN squad and two members selected for Combined Services. Armed Services Short Course Masters Championships held at Aborfield. Club swimmers did well and achieved the following eight 1st places, five 2nd places, three 3rd places, two 4th places. First club dinner arranged by Amanda Beare and Sophie Wright. The Club well established within the Armed Forces and the ASA. Many swimming events attended though out this year. At the Club AGM in December it was decided to change the name of the Club, as it now consisted of 70 percent Naval units and 30 percent Royal Marine units. It was decided to call the Club, Plymouth Royal Navy / Royal Marines Swimming Club. The committee decided to form a junior section to the Club. The first session consisted of 7 helpers and 24 children. Today the junior section has approximately 200 swimmers, ranging from non-swimmers to competitive swimmers. The Club has representation in Swimming, Water Polo, Open water swimming, Technical officials and Life Saving. Our adult swimmers compete at Club to National level. First Plymouth RN/RM SC junior gala held at HMS Drake. Colonel & Mrs Bancroft presented prizes. A press release on the Junior section in the Plymouth Evening Herald. First Junior section gala held, HMS Drake v HMS Raleigh junior sections. In August, the Naval Base Children Summer Activities 1997 lasting one week took place. Fifteen children attended and the Club organised the swimming sessions. • October saw the first Teachers meeting held at Crownhill Naval Community Centre. • Club members represented the Royal Marine Corps v Army Corps Championships. • First Junior Section Christmas party and award Presentation afternoon held in HMS Drake senior rates mess. . Presentations made by the Club President Capt J Atkinson RM & Mrs Atkinson. Club members now regularly serving on the following committees:- City of Plymouth ASA, Devon County ASA, Western Counties ASA, Royal Navy ASA, Royal Marines Swimming Association, Royal Marines Sports Association. Junior section swim Weekend at Norton Manor Camp, 31 children and 20 parents took part. Children Christmas party and presentation afternoon held at HMS Drake, Captain Tall RN presented prizes. The Club entered an Inter Club Gala at Kingsbridge and achieved first place overall. Nick Vaughan gained four British titles at Sheffield 50 & 100m Butterfly, 50 & 100m Freestyle. At Torquay Leander Sprint Meet, many personal bests were achieved. Gold, Silver, and Bronze medals were won by club swimmers. The Port of Plymouth 4 x 2 Freestyle Relay, for the Evening Herald Shield,was won by Matthew Kerrigan, Bryn Marriott, Dean Marriott and James Parsons. The Port of Plymouth 4 x 2 Freestyle Relay, for the Johnston Trophy,was won by Amber Murch, Andrea McElroy, Kerry-Ann Harbottle and Claire Parsons. The following swimmers made Devon County Times this year, Kerry-Ann Harbottle, Megan Higgins, Steven Johnson, Nicholas Kerrigan, James Parsons, Nicholas Vaughan and Scott Fairey. The Club took part in another Inter Club gala hosted by Exeter City SC, competing against Exeter, Devonport Royal S.C, Tavistock S.C, Mendip S.C and Torridgeside S.C.
Plymouth RN/RM SC 4 x 2 Open boys team entered the Mount Wise Trophy. The team consisted of Bobby Pearson, James Parsons, Bryn Marriott and Steven Johnson and swam against Devonport Royal, Port of Plymouth, Plymouth Leander, Dinnaton, and Tavistock. Water Polo tournaments held at HMS Raleigh and organised by the Club. Club membership now totalling 175 Juniors and 49 Adults. An Inter Club gala at Kelly College,Tavistock saw Michael Wafer, Chloe Walker, Charlotte Collins, Holly Coombes, Oliver Williams, Mahayla Attis, Christopher Philpot, Hannah Wilson, Jessica Bayes, Ben Simmons, Jessica Ingram and Michael Waite all achieve personal bests. Oliver Williams, Chris Philpot, Lawrence Coombes, James Wilson, Hannah Partridge, Peter Meachin, Simone Linney, Nicola Linney, Simone Linney, Jessica Bayes & Holly Coombes. HMS Drake swimming pool closed in August for refurbishment. Limited pool time was available at HMS Raleigh. HMS Drake pool reopened in September after being closed for over a year. The club still functioned and entered the normal round of swimming galas. A number of swimmers entered the Royal Navy Masters Open meet at HMS Heron. They all did well and gained the following awards. • Our Ladies 200m Freestyle Relay 120 – 159 years - Silver. The club came third out of 17 teams, a total of 39 medals were gained. Swimming Officials from the club again attended the event. Unfortunately, the pool at HMS Drake closed again in April for installation of a new filtration system and starting blocks. It re-opened in June but then closed again between 23 - 27 September and from Nov to 22 Jan 05 for rectification of other defects. 22 January HMS Drake re-opened. The Devon County Championships were well supported by Club Officials. Ann Grantham, Dave Forward, Kath Forward, Julie Nunn, Chris Robinson and Chris Fairey MBE all attended. Jack McElroy, Karen Partridge, John Aitken, Jane Traverna, Sofie Humphreys and Andrew McElroy all passed the Pool Bronze award. The RNASA Masters meet held at HMS Heron was again well attended by Club members. Simon Jackson, Ann Grantham and June Porter won their age groups and Kath Forward participated in some events. They all gained many medals. Club Juniors attended the IMPS gala at Torquay and came 5th out of 6 teams, ahead of Port of Plymouth SC. At the Royal Marines Swimming Championships, Club swimmers and officials participated at all levels. • L/Cpl Quinton Linegan won the Laws Trophy for the most improved Water Polo player. • WO 2 Simon Jackson won the 800m Trophy. • Club Swimmers Ann Grantham, June Porter, and Kathryn Forward swam at the Devon County Masters championships, all three became Devon County Champions in their age groups and were selected to represent Devon in the National County Championships. • Result of the junior section gala was HMS Raleigh 292 points, HMS Drake 268 points. • MA Rebecca McAlister came seventh in the City of Plymouth ASA Open water swim. • WO 2 Simon Jackson RM, swam in the World Masters Championships in Canada and came away with a Bronze medal. Roger Lawton completed the City of Plymouth Breakwater Swim. Many city swimmers entered the Devon County Masters from Dinnaton SC, Port of Plymouth SC, Plymouth Leander SC, Tavistock SC and Plymouth RN/RM SC. Club swimmers Ann Grantham, June Porter, Kathryn Forward and Simon Jackson, won Gold, Silver and Bronze medals and all four were selected to represent Devon at the Inter County Championships. June Porter and Ann Grantham represented Devon in the Masters intercounty championships. Devon won the south west region and went onto come 4th Nationally. Club Officials and 8 female swimmers represented the Club at the Devon County Championships. At the 2007 RNASA Masters meet at HMS Heron, Ann Grantham won 50m, 100m, 200m and 400m Freestyle. Kathryn Forward and Joe Kerrigan won bronze medals in the 200m and 400m Freestyle. Simon Jackson won silver in the 50m Butterfly and bronze in the 100m Freestyle. The RMB Stonehouse Swimming Championships held at HMS Drake, saw new records by Joe Kerrigan in the 400m Freestyle (5.06.71), Christopher Philpot in the 200m Freestyle (2.20.44), the over 12 years 25m Freestyle (12.90), and the over 13yrs 25m Freestyle. Rhian Roberts over 12yrs Girls 25m Freestyle (14.25). Ann Grantham represented the Club in the Guernsey International Master’s Meet, gaining silver medals in the 50m, 100m, 200m and 400m Freestyle. Ann Grantham and Joe Kerrigan represented the Club at the ASA South West Masters at Hutton Moor. Ann won gold medals in the 200m and 400m Freestyle, Joe won gold in the 100m Individual Medley and silver in both the 200m and 400m freestyle. In October a Swim 21 Sub committee was formed and Plymouth RN/RM SC signed up with ASA SW to work towards accreditation in October 2008. The committee was lead by Diego Walker as the Swim 21 Co-ordinator. Club membership stands at 144 Juniors and 122 Adults. Club members attended RNASA AGM Dinner held at RMB Stonehouse Officers Mess. Club membership 148 Juniors and 109 Adults. The following passed the ASA level 2 teachers course, June Porter, Martin Slator, Diego Walker, Steve Marriott and Stuart Robinson. Nine club swimmers competed in the Devon County Sprint meet at Central Park. The RMB Stonehouse Swimming Championships held at HMS Drake, saw new records by Rhian Roberts 50m Butterfly (35.84), 200m Breaststroke (3.14.32), Girls Veteran over 12 years Freestyle (14.09), Adam Bolton 50m Butterfly (29.37), 100m Freestyle (1.00.06), 100m Backstroke (1.09.99), 100m Butterfly (1.04.28), 400m Freestyle (4.38.20), Zoe Porter 25m Breaststroke (9.96), Jordan Roberts 100m Backstroke (1.21.03). Rhian Roberts achieved 4th BAGCAT Award at the Devon County Championships. Ann Grantham picked up 4 Golds at the RNASA Masters meet at HMS Heron. Club Swimmers represented Devon County Masters who won the South West Inter-county competition at Bridport on Sunday 21st May 2008. Despite some swimmers missing, the team proved too strong for the other counties, finishing first for the second year in a row with 174 points. They were 25 points ahead of Dorset with 149 points. Somerset had 101, Gloucestershire 100 and Wiltshire 41. After much hard work over many years, Plymouth RN/RM SC awarded Swim 21 accreditation in October 2008. Yet again a number of swimmers took part in the City of Plymouth competition with many medals being won. Nicola Porter, Lucy Smith, Zoe Porter, Jordan Roberts, Chloe Walker & Rhian Roberts. In December, the ASA SW regional development officer recommended that the Club should apply for the SCOTY sports club of the year 2009 award. Application completed and endorsed by the RDO. In February, SCOTY application considered by the National ASA board who selected the Club to go through to the final selection as one of only three Swimming clubs in the country for Sports Club of the year. This was quite an achievement and one that the Club is proud of. Unfortunately there was no Swimming clubs selected for the final prizes. RMB Stonehouse Swimming Championships held at HMS Drake during March, new record by Rhian Roberts in the 4 x 1 Individual Medley. Royal Navy May West Country Week-end Water Polo Tournament held at HMS Raleigh, teams participating Devonport Royal, Newquay Waterpolo, Barnstaple and Royal Navy. Club members participated in the Plymouth Command, Royal Navy Inter Commands and Inter Service Championships. A number of our swimmers took part in The City of Plymouth Championships. Lucy Smith, Vicky Frisby and Lois Casey took part and gained some personal best times. Zoe and Nicola Porter, Chloe Walker, Jordan and Rhian Roberts gained a number of medals between them as well as achieving some great times. Jordan won a gold medal in 50m Backstroke and set a competition record, well done Jo. Nicola also won a BAGCAT award for coming 6th in her age group in the competitions. Rhian, Jordan and Nicola gained qualifying times for Devon County age group championships. Our junior team had a great friendly gala at Tavistock and came second. They were only 11 points behind the home team, even though the club were unable to take part in some of the events due to a lack of boys. Everyone had fun and all swimmers did really well. City of Plymouth Waterpolo Tournament held at HMS Raleigh during December for the Lamb Trophy teams Royal Navy, Newquay, Devonport Royal and Paignton. Winners Newquay. Royal Navy West Country Swimming Gala new records by Caitlin O’Malley 200m Backstroke, Rhian Roberts 4 x 25m Individual Medley and 50m Freestyle, Adam Bolton 4 x 50 Individual Medley and 50m Freestyle. RMB Stonehouse Championships new records by Zoe Porter 25m Breaststroke and Caitlin O’Malley 50m Breaststroke. Club swimmers entered Royal Navy Western Region Swimming Championships. The Club Championships were held over a two week period, from 5 Jul – 15 Jul 10. The main sessions of the event took place on Saturday 10 July, with the longer events being held in the evenings of Club weekday water time. This was a change from previous years and worked well, allowing competitors to rest properly between events. The number of competitors, both male (20) and female (24) entering the event increased this year, with a total of 294 swims, or ‘’splashes’’ as they are commonly referred to, an increase of 60 compared to last year. The competitors were mainly youngsters in the age group of 8 – 17, some of which were competing for the first time and a number of our more mature swimmers also took part. It was pleasing to see the increased number of male swimmers. In previous years there has been a lack of boys in the Club. The hard work of the Swimmers, Coaches and Teachers over the year was evident, as a total of 35 new records were achieved and ratified at the AGM in November. They should all be proud of these results. Many parents assisted with the running of the event and were introduced to jobs such as timekeeping, announcing and competitors steward. All the assistance was appreciated and helped make the Championships a success. The swimmers can now look forward to the City of Plymouth Championships in October, and receiving their awards at the Club Presentation evening in November. As well as the Club Championships, on Wednesday 14 July 10, the annual junior section gala was held at HMS Raleigh. This was a close competition between HMS Drake and HMS Raleigh, which the referee deemed a draw. Many swimmers took part, some as young as five. They all tried hard and swam well to win points for their teams. Despite frequent downpours of rain, the Gala was followed by a BBQ attended by approx 200 Club members and families. The two volunteer chefs did well to complete with the weather and the evening was successful and enjoyed by all. Approximately £150 was raised for Help for Heroes. June Porter Wins Regional ASA Awards. Congratulations to June who was honoured with the South West Regional Development Coach of the year Award. Additionally, the ASA awarded June with the Volunteer Coach of the Year award which came as a nice surprise. The ASA award ceremony was held in Taunton, which June attended with her family and Diego Walker our Chairman who represented the Club at this special event. This award is richly deserved by June, and is recognition of the many hours she devotes to coaching our squad swimmers. June completed her Level 3 course this year and has now taken over from Ann Grantham as Head Coach. After many years of hard work as Head Coach, Ann assumed the role as Assistant coach and continues to support June in her new position. Caitlin O’Malley took part in the Open Water Plymouth Breakwater swim, achieving a respectable seventh place overall and was third lady home. The Club also provided an official and first aid cover for this event. RMB Stonehouse Open Meet held at HMS Drake in October. The Presentation evening was held in November at the Warrant Officers and Senior Rates mess, HMS Drake. Awards were presented by the Commonwealth medal winner Anthony James of Leander swimming Club and Dean Roberts our Vice Chairman. Paul Evans did an excellent job as the compare and a good night was had by all. City of Plymouth Waterpolo Tournament held at HMS Raleigh for the Lamb Trophy. Father Christmas attended the Christmas party held at HMS Raleigh along with over 80 children. Katie Want and Nicola Porter qualified for the Devon County Championships. Katie for the 100m butterfly and Nicola both 50m & 100m breaststroke. 5 swimmers from the club took part in the masters competition, this year the event took place at Millfield. June Porter gained a 2nd in 50m backstroke and 3rd in 50m breaststroke. Caitlin O’Malley and Pete Redbourn also took part and Diego Walker was officiating. Ann also received an award from the Navy (top swimmer) for achieving most points throughout the year. 5 swimmers took part in the Devon Development sprint gala; Emily Walker, Alice Kellett, Katie Want, Gabriel Cox and George Moss. There were 12 records broken at the RMB swimming championships. Caitlin O’Malley broke the 25m, 50m & 100m Butterfly, 100m Backstroke. Jordan Roberts broke the 25m Backstroke and her twin sister Rhian broke the 25m Freestyle. The girl’s team also broke the 4 x 1 Freestyle relay record. In the men’s events Adam Bolton broke the 25m, 50m & 100m Freestyle, 25m Backstroke and 100m Butterfly records. Ann Grantham returned to her home island of Guernsey again to compete in their open competition (using her full name) She won a 1st in 50m freestyle, 2nd in 100m & 400m freestyle and 100m IM and 3rd in 200m freestyle. Rhian Roberts broke the 4 x 25m Individual Medley record and the record for the mixed 8 x 1 Freestyle relay was also broken. 5 swimmers took part at Kingsbridge; Alice Kellett, Emily Walker, Allys Williams, George Moss & Katie Want. Rhian Roberts 100m butterfly & 50m freestyle. We were invited to take part in this gala and had 18 swimmers able to take part. Although we had to swim many swimmers up to cover all age groups the club team did really well. The team were able to show off the club t-shirts & shorts donated by the RN. Caitlin O’Malley and Steve Echells represented the club is this swim. 8 swimmers took part in this competition with some good PB’s; Emily Walker, Katie Want, Alice Kellett, George Moss, Gabriel Cox, Emma Lowe and Nicola & Zoe Porter. 9 new records were set; Adam Bolton 100m Freestyle, Micky Nolan in 100m Backstroke, Rhian Roberts in 4 x 1 Individual medley, Caitlin O’Malley in 100m Backstroke & 200m Individual medley. Also in both male and female 4 x2 medley and freestyle relays. 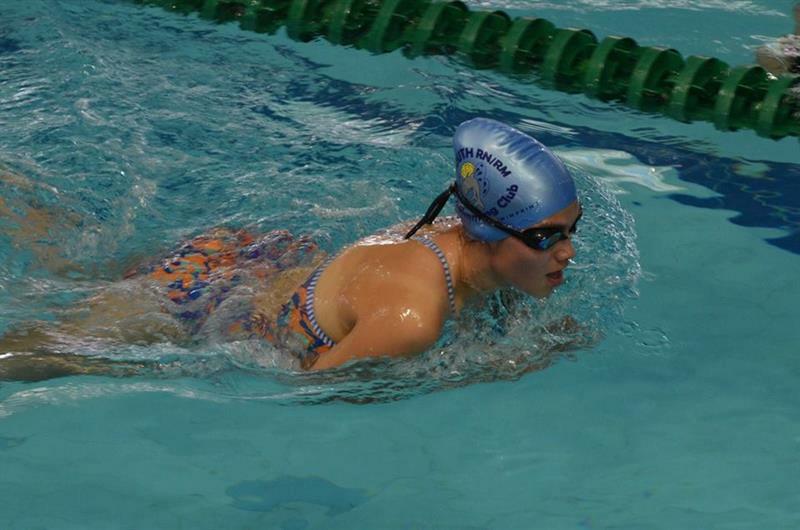 Nicola Porter came 1st in the 100m Butterfly, 2nd in 50m breaststroke and 3rd in 50m & 100m Freestyle and 100m IM. Katie Want came 3rd in 100m Butterfly. Ann gained a 2nd place in the 100m freestyle. As usual a successful presentation evening at the RMB Stonehouse with Aaron Richaus and Lauren Vertigan presenting the prizes. Both are swimmers from Plymouth Leander who swam in the Youth Games and hope to be Olympic contenders. The competitive swimmers, older swimmers and parents held a skittles and pizza evening at the skittle alley in HMS Drake. Caitlin O’Malley gained 2nd in 100m backstroke, 50m & 100m breaststroke and 100m IM and 3rd in 50m breaststroke. Pete Redbourn gained 3rd in 100m & 200m freestyle. This year’s Devon Sprint gala took place at the Life Centre in Plymouth with 7 swimmers taking part; George Moss, Alice Kellett, Emma Lowe, Emily Walker, Katie Want, Allys Williams and Nicola Porter. Nicola won a gold medal for the 50m Breaststroke. Ann Grantham gained 3rd in 50m, 100m, 200m & 400m freestyle. 9 swimmers took part in the Devon Development gala; George Moss, Katie Want, Allys Williams, Josh & Rebekah Marr, Alice Kellett, Emily Walker, Emma Lowe and Gabriel Cox. George gained a 1st place in the 100m Backstroke and 2nd in 100m freestyle. Katie gained a 2nd place in the 100m Freestyle, 100m individual medley, 100m breaststroke and a 3rd in the 100m butterfly & 100m backstroke. Katie also was award 5th place in the BAGCAT for her age group. 6 records were broken in the club championships this year in different age groups. Adam Bolton broke records in the 100m Butterfly, 100m Backstroke and 50m Freestyle. Tia Want broke the 200m Backstroke, 200m Freestyle & 200m Individual medley. George Moss broke the records in the 50m Breaststroke, 50m Butterfly, 800m freestyle & 200m Individual medley. Emily Walker broke a record in the 200m Backstroke. Martin Simms broke 2 records in the 50m & 200m breaststroke. Caitlin O’Malley broke the 200m butterfly record. Grace Kellett broke the 25m freestyle record. Rebekah Marr broke the 200m Individual medley record. Nicola Porter broke the 200m Butterfly record. Katie Want broke 6 records in the 50m & 200m butterfly, 100m, 200m, 800m & 1500m Freestyle. The usual fun was had at the gala and barbecue with the results ‘surprisingly’ was a draw! Caitlin O’Malley took part in this event again this year with Nick (Frankie) Vaughan. The weather conditions were not as ideal as previous year but still a successful event. Caitlin O’Malley took part in this open water swim for the first time. The senior swimmers had to complete 5km in the bay. Swimming around buoys. June & Zoe Porter helped with timekeeping whilst Diego Walker (Whiskey) went out in the safety boat. 8 swimmers and 1 official (Diego Walker) went to the Devon County senior & Masters Competition at Tiverton Pool. Martin Simms won 1st in 100m butterfly, 100m IM, 100m backstroke, 2nd in 100m freestyle, 50m backstroke and 100m breaststroke and 3rd in 50m breaststroke and 200m freestyle. Ann Grantham won 1st in 50m, 100m & 200m freestyle and 50m breaststroke. Nicola Porter won 1st in 50m & 100m breaststroke and 100m butterfly, 2nd in 50m butterfly and 3rd in 100m IM. 10 swimmers travelled to Exeter to take part in their sprint gala; George Moss, Josh & Rebekah Marr, Nicola Porter, Emma & Dan Lowe, Katie Want, Alice Kellett, Gabriel Cox and Emily Walker. Ann won 1st place in 25m freestyle 7 25m breaststroke and 2nd place in 50m & 100m freestyle and 50m backstroke. This year we had 8 swimmers taking part in the competition; Nicola & Zoe Porter, Allys Williams, Katie Want, George Moss, Alice Kellett, Gabriel Cox and Emma Lowe. Ann Grantham gained 4th place in 50m, 100m & 200m freestyle and 50m breaststroke. Ann Grantham swam for the Devon County team who won the regional competition and came 4th nationally. This year the presentation was divided into championship presentation and junior presentation as the event was become too big for the RMB Stonehouse. The championship event was a great success with award. The competitive swimmers and parents once again held a skittles evening in HMS Drake with once again Pizza’s being on the menu. Katie Want qualified for 7 events & George Moss qualified the 50m backstroke for the Devon County championships. Caitlin O’Malley broke the 100m & 200m Breaststroke records in the Championships this year. Also records were broken in the ladies 4 x 1 Freestyle relay and the mixed 4 x 1 Freestyle relay. Caitlin O’Malley and Ann Grantham took part in the Masters competition at Millfield. Ann gained a 1st in 50m freestyle, 2nd in 100m & 400m freestyle and 3rd in 200m freestyle. Ann Grantham won 1st place in 50m, 100m, 200m & 400m freestyle. 7 swimmers took part; Emily Walker, Alice Kellett, Harrison Lake, Gabriel Cox, George Moss, Katie & Tia Want. Katie Want gained 2nd in 100m backstroke and 3rd in 100m butterfly. There were 21 records broken at the club swimming championships in the different age groups. Carys Williams broke the 25m Backstroke record. George Moss broke the 200m breaststroke & 200m Individual Medley. Tia Want broke 9 of the records for 50m & 200m Backstroke, 50m & 200m Breaststroke, 50m, 200m & 400m Freestyle and 100m & 200m Individual medley. Caitlin O’Malley took part in the Oddicombe swim again this year, swimming 5 km in the senior event around the bay. This year the temperature was much colder and there were a number of swimmers stung by jelly fish. 8 swimmers took part in the Devon county senior & master’s competition with all winning medals. More of our younger swimmers were able to take part as they are now 15. Caitlin O’Malley was unable to take part but officiated for the day. Emma Lowe won a 2nd in 200m freestyle & 3rd in 50m Breaststroke. Nicola Porter won 1st in 50m & 100m Breaststroke and 50m backstroke, 2nd in 100m IM and 3rd in 50m freestyle. Ann Grantham won 1st in 50m, 100m & 200m freestyle. 7 swimmers took part in the sprint gala again. Although it was once again a very long day (31 heats for girls 100m IM) all swimmers did really well after their summer break. Swimmers were Alice Kellett, George Moss, Emma Lowe, Allys Williams, Nicola Porter, Tia & Katie Want. Ann Grantham took part in the South West masters competition and won 1st in 25m, 50m & 100m freestyle and 25m breaststroke. 9 swimmers took part with all achieving PB times. Emily Walker, Tia Want, Dan Lowe, Alice Kellett & George Moss. Nicola Porter gained 2nd in 50m Breaststroke, 3rd in 50m & 100m butterfly. Emma Lowe gained 3rd in 400m Freestyle. Katie Want gained 3rd in 50m butterfly. Ann Grantham won 1st in 50m & 200m freestyle and 2nd in 100m & 400m freestyle. A successful presentation evening held in RMB Stonehouse. This year it was decided to revert back to separate presentation events for those who took part in the club championships and certificate swimmers. This year the female swimmers of the year was Emily Walker and George Moss was the male swimmer. The teacher of the year went to Chris Fairey and the Chairman’s trophy went to Caitlin O’Malley. 18 swimmers took part in the Tavistock friendly gala organised by the Tavy young volunteers. The club championships in July were held in the new pool with a great number of swimmers taking part with the majority of swimmers having personal best times. The swimmers enjoyed some sessions of water polo organised as usual by Caitlin O’Malley. Even some of the adults joined in. Katie Want and Emma Lowe, our two 16 year old swimmers passed their level 1 Aquatic teachers award. Katie went on with Nicola Porter to complete their life guarding award. George Moss gained 1st in 50m & 100m Freestyle, 50m & 100m backstroke, 50m & 100m breaststroke, 50m butterfly and 100m individual medley. 5 swimmer took part in this long gala at Exeter in September - Denver Brennan, Emily Walker, Katie Want, Tia Want, Alice Kellett. It was yet another tiring day but some personal best times were achieved, which was good after the summer holidays. This was the first time this gala had taken place and had 23 of our young swimmers aged 9 (some 8) to 12 years. Most of the events were relays which gave the swimmers opportunity to raise the team spirit. Some have never taken part in this type of event before. Although we came last the team spirit and experience for them was great. This was once again a successful event. This year it moved venue to The China Fleet Club in Saltash, with pizza and chips being the chosen meal. This year we celebrated 25 years as a swimming club. Rob Lowe with the help of others (including his family) arranged an ‘It’s a Knockout’ type of event. Each session from 9am till 12 noon had various stations for the swimmers to take part in from waterpolo, chair relay to pulling team members in a life ring and collecting floaters and sinkers. One of these floaters accidentally set off one of the fire alarms and for a while everyone had to evacuate the building. Spirits were kept high as the soggy children were huddled like penguins and head shoulders knees and toes sung to keep warm in the sunny but cold day. It wasn’t long before everyone was able to return to their fun. The morning was so successful it could even be an annual event? 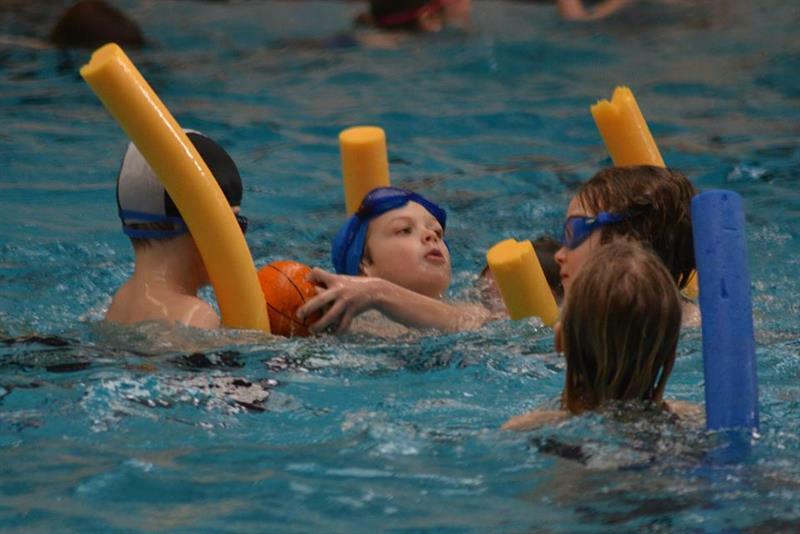 The last swim of the Christmas term was the usual waterpolo fun. On Monday 15th the squad swimmers once again played skittles in HMS Drake instead of swimming. They enjoyed pizza, crackers and a great ‘killer’ game with Josh Marr & Andy Kellett going head to head for a nail biting finish with Andy taking the crown. Fourteen swimmers took part in the Devon County Sprint gala at the Plymouth Life Centre; Nicole Frisby, Eleanor Pile, Tia & Katie Want, Molly & Jack Slator, Emily Walker, Alice Kellett, Dan & Emma Lowe, Josh Marr, Ehren Duke and Denver Brennan. George Moss gained a silver in the 17 & over 50m butterfly and bronze in both the 50m backstroke and Freestyle. Seven swimmers took part in the Devon Development Gala at the Plymouth Life centre. 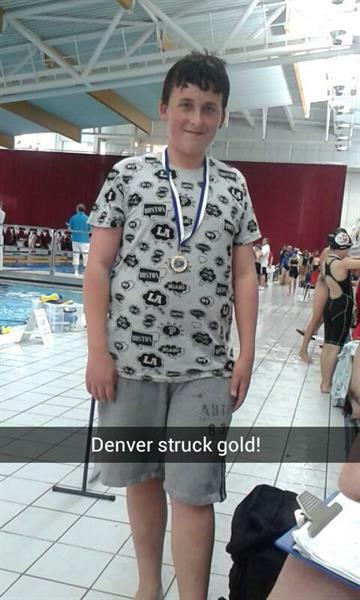 Denver Brennan gained a Bronze in the 15 years 200m Individual Medley and 100m Backstroke. Once again it was a successful year for swimmers at the Club Championships with 21 new records and 1 new record being set. This year there were 10 swimmers from HMS Raleigh who took part. 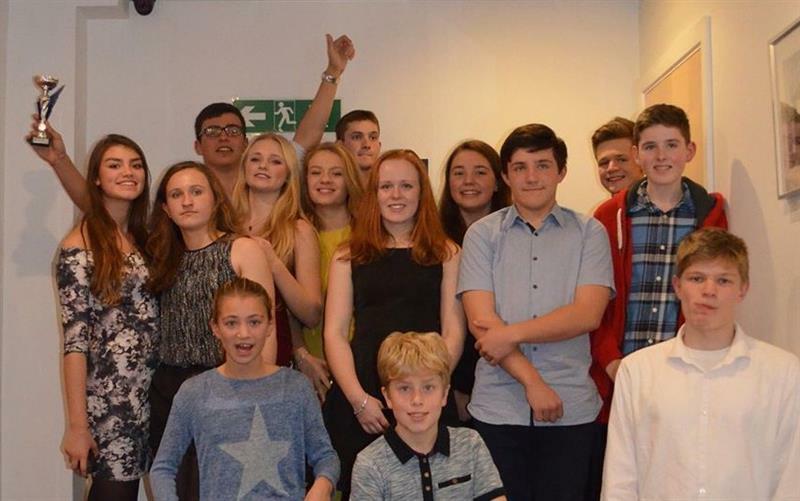 The fun gala at HMS Raleigh was once again a draw with swimmers and families enjoying a pasty in celebration of their achievements. At the beginning of the gala a cheque was presented for £2447.88 to the RMGT and a further £300 was going to go to the RNLI on behalf of Brian Ferrand who was a loyal club member and teacher at HMS Raleigh who passed away earlier in the year. Once again we had 2 swimmers from the club taking part. Caitlin O’Malley who came 2nd in the ladies and Scott Lamont who came 3rd in the mens. Caitlin O’Malley travelled to Bournemouth to take part in the 5km open water swim with other Navy swimmers. She did well despite the weather being wet and the water choppy. The day after the Open water at Oddicombe Scott took part in the Chestnut charity swim fromthebreakwater. Also swimming was Colin Davies another member of our club. He also appeared at the end of the BBC Spotlight video of the event. 8 swimmers took part in this year’s Devon County Senior and Masters competition at Tiverton. They came away with a big medal hall and a number of personal best times. The club took part in the 2nd Network gala at the Plymouth Life Centre. There were less clubs taking part this year but our club was proud of our swimmers which included some from HMS Raleigh. Although we can last all the swimmers enjoyed the gala and did really well. Jack in the 16 year olds won 1st in 200m Individual medley & 200m Breaststroke, 2nd in 100m Freestyle, 100m Breaststroke, 100m Backstroke and 3rd in 50m Freestyle, 50m Backstroke & 50m Breaststroke. Father Christmas paid a visit to the junior presentation which added some excitement to the swimmers who were presented with their many certificates. The Monday squad swimmers enjoyed the usual end of term, Christmas Skittles evening at HMS Drake. A enjoyable social evening with pizza. 13 swimmers took part in the Devon County Sprints at the Plymouth Life Centre, with all achieving personal best times in nearly all of their races. The swimmers were Nicole Frisby, Tia Want, Emily Walker, Emma Lowe, George Saxby, Sam Rhodes, Jason Bott, Hayden Gould, Dan Lowe, Jack Slator, Madeline Lynch, Abigail Finnie and Abigail Duggan. Sam Rhodes came 2nd int he 13 years 50m Breaststroke. In March we also ran the 2nd Spring gala with additional swimmers from HMS Raleigh. 11 years & under winners were George Saxby & Abigail Duggan. Nicola Porter broke the 25m & 50m Breaststroke. 10 swimmers took part in the Devon Devon development galas in June with them once again achieving personal best times. The swimmers were Abigail Duggan, Emily Walker, Alice Kellett, George Saxby, Jason Bott, Madeline Lynch, Tia Want, Hayden Gould, Sam Rhodes and Abigail Finnie. Jason came 3rd in the 13 year old 100m Breaststroke. Caitlin O'Malley broke the 17 & over age group 50m Breaststroke which was last broken in 1994. The championships were once again a success due to the help and support of the band of volunteers who officiated and helped it run smoothly. Scott Lamont, who has been training to take part in the Royal Navy Channel relay, took part in the City of Plymouth Breakwater swim on the 23rd July. The weather was ideal and Scottie finished 4th overall and 2nd in the mens event. Diego Walker successfully organised and ran this years event, after taking over from Maggie Pike, who was on had to help with the hand over. June & Nicola Porter helped with timekeeping along with Chloe Walker. Helen Walker was on the beach and Adam Bolton was the beach first aider. Barry Moss kindly offered his services and one of the supporting kayakers. There were plenty of RNRM members on the beach to see the swimmers in. Scott Lamont then completed the Devon County Open Water 3km swim at Oddicombe Beach the following week on the 31st July. the Walker family were again helping, this time with Emily helping June & Nicola Porter with the timekeeping.